This delicious easy caramel icing recipe is made with everyday kitchen staples and is super quick to make! It beats store bought icing ANY day! 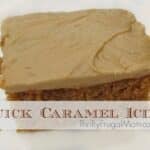 This Easy Caramel Icing is so delicious and it’s simple enough that even an inexperienced cook can make it. We love it with my Best Ever Chocolate Cake and it also goes perfectly with Gingerbread Cake, a yummy winter dessert. If you are worried about not being able to eat a whole cake, you can easily half the recipe. Or just make a whole cake and freeze part of it. Cake is something that freezes really well and it’s always handy to have things like that in the freezer! This simple caramel icing, made from 4 everyday kitchen staples, is absolutely delicious and crazy easy to make! Melt butter and brown sugar together on low heat. Bring to boil and boil 2 minutes, stirring constantly. Add milk and heat just until boiling again. Remove from heat and cool slightly. The icing will be pretty runny initially, but it will quickly start to firm up. This makes plenty for a 9×13 cake- in fact, you might not even want to use it all if you don't like lots of icing. This looks amazing! I have a feeling I could just eat it with a spoon. No cake necessary. :) Pinning! I had pinned a recipe for a chocolate cake with caramel icing that was on the parents.com blog. I believe it was your recipe That link is no longer there. Do you have the recipe for the chocolate cake that went with this icing. I loved the cake and can't find the recipe anymore. Thanks for your help. 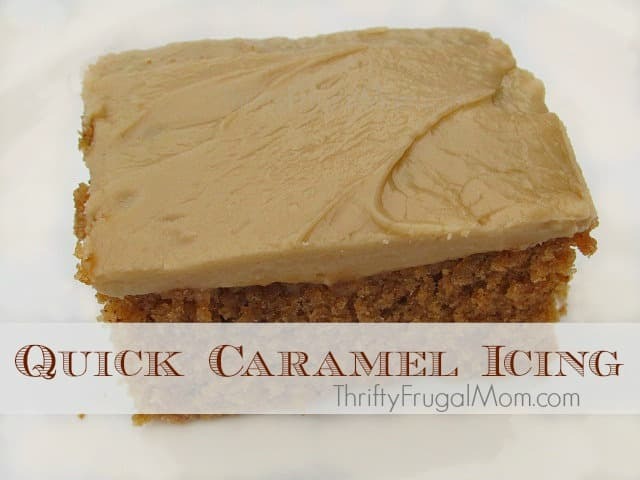 This icing should be called "Killer Caramel Frosting"! I have tried many caramel icing recipes over the years because it was my dad's absolute favorite. Most are complicated and not nearly as delicious as yours. I wish he was still here to enjoy this cake. He would have flipped! I like to think he is here with me sometimes...maybe that is why I tried your icing today. Thanks so much for posting this one. Aw, thanks so much, Lisa! It really is the best caramel icing recipe ever I think. :) And I wish too that your Dad could have enjoyed this...and I'm happy that it could remind you of your good times with him. He was lucky to have a daughter that cared so much about him! I found a great recipe for apple cake and this recipe was my 3rd try for the perfect caramel frosting to top it off to perfection. Hands down, this one takes the cake! Thank you for sharing! Oops. I left the frosting cool for too long, so had to use another tablespoon or so of milk in order to get the sugar to blend! We had this on brownies. Oh. My. Good. #sugar_rush. The spouse and the son both like this. We'll make it again. Oh, brownies with caramel icing sound delicious! And glad you figured out how to redeem the situation of letting it cool too long. I probably should change the directions because you really barely need to let it cool and as you found it, it doesn't take much before it starts to thicken/harden.